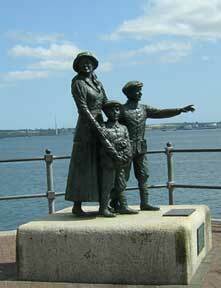 Until six months ago, Waco could claim one of the most famous Irish immigrants in American history as its own. Let’s call this saga The Tale of Two Annies. 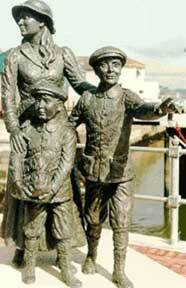 When 14-year-old Annie Moore of County Cork, Ireland, descended the gangplank of the steamship S.S. Nevada on Jan. 1, 1892, as the first of 700 immigrants arriving that day at the brand-new processing station at Ellis Island, she was swept away on the arms of dignitaries. Hustled past patriotic bunting of red, white and blue, amid the celebratory din of bells and steamer whistles, young Annie was awarded a $10 gold coin before she and her two younger brothers were reunited with their parents, Matthew and Julia Cronin Moore, who had immigrated to New York City three years earlier. From there, she seemed to disappear into the mists of time. She was found almost 20 years ago, as researchers preparing for the dedication of the renovated Ellis Island facilities which were turned into a national museum of immigration uncovered a tale that was, alas, too good to be true. The story they spun was like something out of the movies: the red-haired colleen’s reunited family moved first to Illinois, they said, then Texas, where Annie met and married Irish-American Patrick O’Connell and had five children. The family moved from Waco, to West Texas and eventually to Clovis, N.M., where Patrick O’Connell died in October 1918 in the great flu epidemic. The story’s tragic close came on Aug. 29, 1923, when the 46-year-old Annie was killed. As she was traveling between Fort Worth and Dallas (a trip to visit her brothers, it was said), she was struck by the InterUrban, one of the earliest rapid transit trains connecting the two cities. She was buried with her late husband in St. Martin’s Cemetery in Tours, near West. But certain details of the accepted saga continued to trouble genealogist Megan Smolenyak. Smolenyak, who began researching Moore’s roots in 2002 for a PBS special on immigration. The document trail for Texas Annie Moore continued to point to a woman born to Irish immigrant parents in Illinois, not in Ireland. So she offered a $1,000 reward last summer to entice other family history sleuths to help her find the right Annie Moore. It took just six weeks for a group of passionate genealogists from around the country to uncover the truth, and the results were announced in September 2006. 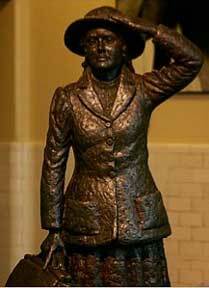 Ellis Island’s Annie actually never left New York’s Lower East Side, the group learned. Annie lived with her parents for a few years at 32 Monroe St. in Manhattan before marrying a German immigrant, Joseph Augustus Schayer Sr., in 1895 at nearby St. James Catholic Church. He was working at the Fulton Street Fish Market when they met, and was a bakery clerk for a time. The couple had at least 11 children, only five of whom survived to adulthood. Three of them had children of their own. 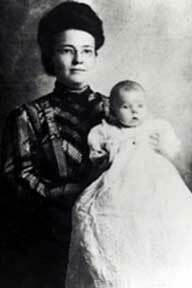 Annie Moore Schayer died of heart failure on Dec. 6, 1924, at age 47. She was buried with six of her children in an unmarked grave at Calvary Cemetery in Queens. Her descendants last fall announced plans to place a headstone on the grave site lost to history for eight decades. So how did the mix-up occur? In her blog, MegansRootsWorld.blogspot.com, Smolenyak said that although there was clearly no malicious intent to deceive, what happened is that a family fell prey to an elderly relative’s fanciful tale Ñ an innocent exaggeration that morphed into indisputable family lore. Over time, this now-deceased woman’s wishful thinking claimed more victims, as folks simply accepted her version of reality as truth without questioning it. In recent weeks, Smolenyak was back in the news, announcing that the Rev. Al Sharpton’s great-grandfather, Coleman Sharpton, was owned by a family related to the late Sen. Strom Thurmond. Smolenyak is North American chief of Ancestry.com, and a prolific author of genealogical texts. Sources: The Texas Collection at Baylor University; Bernadine Rice, American Irish Historical Society; IrishConnectionsMag.com, ConnorsGenealogy.com, IrishNews.com, Handbook of Texas Online and IrishEcho.com.